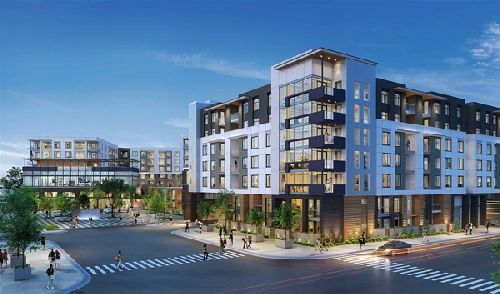 Sunroad Enterprises has secured a $145 mil senior loan for the development of Sunroad Centrum Phase 6, a seven-story, 442-unit, Class A multifamily development in San Diego’s Kearny Mesa neighborhood. The project will be the final phase of the 25-acre Centrum master-plan, which Sunroad Enterprises has successfully developed to include more than 800 multifamily units and one 11-story office tower. The project will feature a 4.2k sf, two-level fitness center, pool and spa, rooftop bar with grill area and outdoor TVs, business center lounge and conference rooms, wine room with outdoor patio, game room, and pet grooming center. In addition to the amenities available onsite, the phase 6 residents will benefit from neighborhood amenities such as the City-owned community park at the center of the Sunroad Centrum development and new restaurants opening in the area. The Kearny Mesa neighborhood sits north of Mission Valley and is advantageously bounded by major freeways to the north, east, and west. Kearny Mesa has a central location within San Diego and is thus easily accessible from other residential clusters and employment centers throughout the region. The financing was provided by PCCP LLC. It was arranged by Aldon Cole, Tim Wright and Bharat Madan with HFF.